Notes: Gauge for setting router bits This is one of the most useful tools to have around if you are setting the height of router bits in your router table or your hand held router. Easy to read scale, easy to set. Notes: This is a jig that makes cabinet making fast, accurate and produces great results - If you've seen the show you know this is one of the most used jigs - Check out the Trend website for more details. Notes: This jig has click in finger technology that allows terrific flexibility in the size and spacing of your dovetails - Features like this are usually only found on jigs costing much more but don't let the price fool you - This is a serious piece of kit for the price and the results you can achieve with it are as good as any fine cabinet maker would create -If you want to build drawers, cabinets, boxes, anything with dovetails in it and you're more interested in the finished result than the art of hand cutting dovetails, then you should take a look at a jig like this. Notes:Another one of David's gadgets. The Point to Pont Marking gauge - Not an essential in the workshop but a time saver if you have to do lots of marking out for evenly spaced points. Notes:This jig has click in finger technology that allows terrific flexibility in the size and spacing of your dovetails - Features like this are usually only found on jigs costing much more but don't let the price fool you - This is a serious piece of kit for the price and the results you can achieve with it are as good as any fine cabinet maker would create -If you want to build drawers, cabinets, boxes, anything with dovetails in it and you're more interested in the finished result than the art of hand cutting dovetails, then you should take a look at a jig like this. Notes:	The T9 and T5 Routers Not much to say about these routers, they are reliable and robust and are one of the best tools you can have in your tool collection - The router is a very versatile tool, used in every project we build on the show. The T9 is a half inch router with a powerful motor - Useful if you want to use it by hand for bigger jobs or to invert in a router table - The T5 is the smaller version, slightly less powerful but easier to handle. We use this when cutting dovetails on the jig or when using the mortise and tenon jig Routers are very inexpensive now but with all things you usually get what you pay for so beware of the cheaper versions. 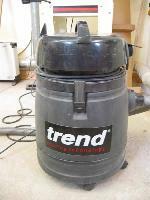 Trend is one of our major sponsors and are the manufacturer of the router equipment used on the show. 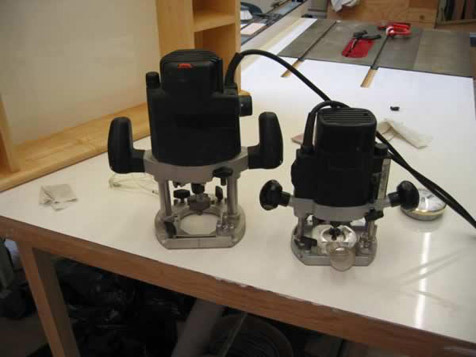 They have a tremendous range of routing tooling, machines and accessories. The cutters are made from the highest quality steel and the equipment is functional and easy to use. Many of the gadgets David uses on the show are supplied by Trend. Routers have been around for a very long time and are always found in workshops and on the job site but these versatile tools are being seen more and more in the DIY Superstores and many households have one. The prices have dropped on power tools over the past few years to a level where they are within everyone’s reach, even if you aren't into building furniture they are a great tool for the home workshop. Check out Trend's online catalogue by clicking on the icon above.